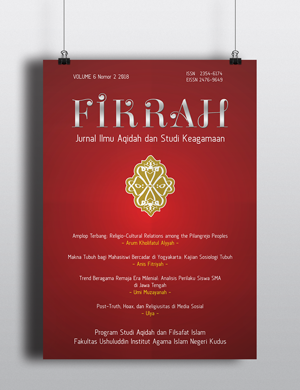 Fikrah: Jurnal Ilmu Aqidah dan Studi Keagamaan is academic journal published by Prodi Aqidah dan Filsafat Islam, Jurusan Ushuluddin, Institut Agama Islam Negeri Kudus collaborated with Asosiasi Aqidah dan Filsafat Islam. Fikrah: Jurnal Ilmu Aqidah dan Studi Keagamaan publish two times a year (each June and December). This journal publishes current original research on the subject covers textual and fieldwork studies with various perspectives of Aqidah, Religious study, Islamic philosophy, Religious sociology, Religious Antrophology.